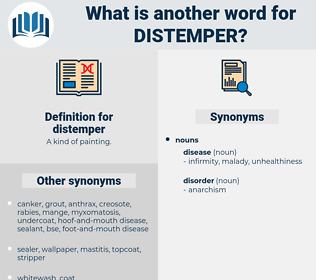 What is another word for distemper? shape, strength, heartiness, wholeness, fettle, wellness, robustness, fitness, wholesomeness, soundness, healthiness, vigor, sturdiness. As the contagious distemper still raged in Charlestown, the Governor judged it imprudent to expose his men to the dangerous infection, unless necessity required it, and therefore held his head quarters about half a mile distant from town. 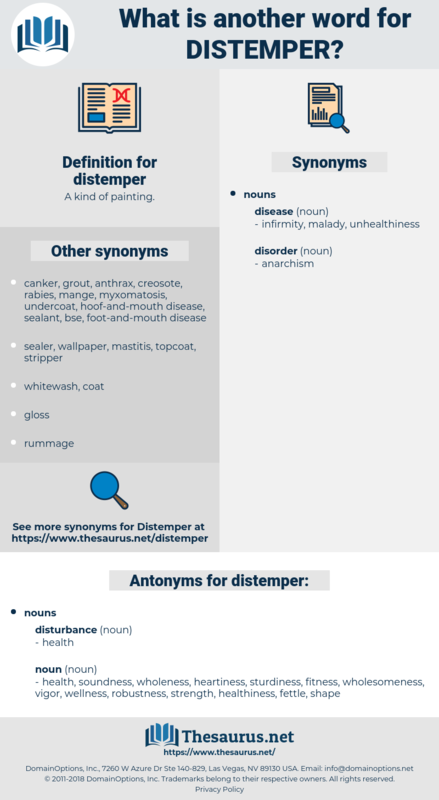 The feature of distemper is the swelling under the jaw, the size indicating the severity of the case. canine distemper, equine distemper, strangles.